Christmas is a busy time of year for keepsake businesses. For all of us, it is a time for family, creating and capturing precious memories, and of course magical for little ones. All of the businesses we work with and support have been putting a huge amount of effort into making Christmas special for all of their customers. From more established artists celebrating their highest ever turnover, to newer businesses making a name for themselves, we’re really proud of them all. We’ve been sharing lots of photos on our Facebook page of some beautiful orders being sent out to lucky customers. Each of our keepsake artists decides on their own product range, so there has been an amazing variety of lovely lovely things. But what’s it like when you are starting out? Well, when you start a keepsake business with us, we don’t just leave you to get on with it. We provide all the help and support you need to get you set up (branding, design, website, social media, product training and more) and then, along with our mega supportive Facebook group, answer questions along the way. Like everywhere else, Christmas has been the hot topic in recent weeks for all of our talented artists. 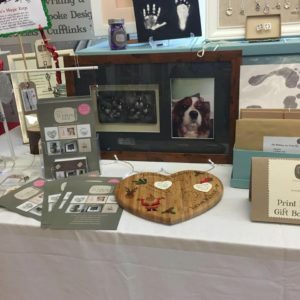 Christmas stalls have been one area of discussion, and we wanted to share photos from three amazing businesses who only set up this year. 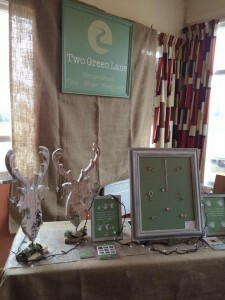 Dotty About Phoebe, The Wishing Jar, and Two Green Lane, have all held beautiful stalls recently. 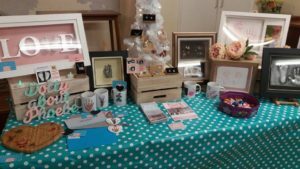 They worked incredibly hard to make them a success, and were also helped by some top tips from our other keepsake artists about what items to take, ways to display products, how to encourage people to sign up to an email list, and gentle sales techniques. December has been frantic for most of our members. But the lovely thing about running your own business is that you decide when you finish for Christmas. Our artists have set their own Christmas order deadlines so they can ensure they complete all of their work in time to enjoy their chosen amount of time off with family and friends. We wish all of them and all of you a very Merry Christmas!